Our Mission: Thunder Rode provides confidence building and rehabilitative training to individuals of all ages with special needs, within aspects of the equine industry. This program will have no boundaries regarding developmental growth, program growth and learning potential for individuals, enhancing their abilities to live and work successfully within the community. - Reaching for new potentials! - Promoting good health, physical fitness, and mental well-being! 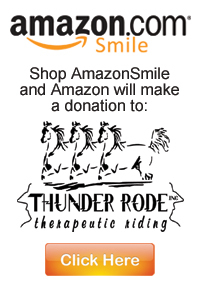 Thunder Rode is a 501(c)3 non-profit organization, consisting of participants and volunteers, horses included! Interact with horses, learn & have fun. If you are interested in participating, please call Michelle at 563-419-8318. Responsibilities include: leading the horses, assisting with games, assisting the Riding Instructor as needed, helping with fundraising events and the many other tasks that make this program successful. If you are interested in volunteering, please call Michelle at 563-419-8318. Would you like to support Thunder Rode by becoming a member? Your membership dues support the program in many ways, including but not limited to: insurance, instructor fees and Drill Team expenses. The riders do not pay to participate in the Drill Team - it is a completely donated effort. If you are interested in becoming a Member of Thunder Rode, please call Michelle at 563-419-8318. 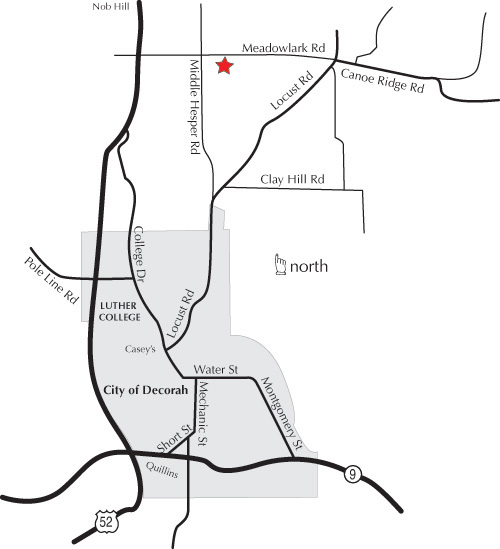 We are located just 4 miles north of Decorah, Iowa! From the North: 1957 Meadowlark Road is about 14 miles south of the Minnesota border, turn East from Hwy 52 onto Meadowlark Road, go straight through the 4-way stop and it's the first farm on the south side of the road. From the South: 1957 Meadowlark Road is about 4 miles north of the intersection of HWY 9 and HWY 52, just outside of Decorah. Turn East from Hwy 52 onto Meadowlark Road, go straight through the 4-way stop and it's the first farm on the south side of the road. Copyright © 2014 - Thunder Rode Therapeutic Riding | Decorah, Iowa - All rights reserved.